In recent years, I’ve made the tradition of a Jew’s Christmas my own. In the United States that’s a movie and Chinese food. But this is Australia so: a swim, a movie, and Chinese food. Lady Robinson’s Beach is on Botany Bay between the mouths of the Cooks River and the Georges River. European settlers (invaders) named this Seven Mile Beach but it was renamed during the tenure of the 14th Governor of New South Wales, Sir Hercules Robinson. He served from March 1872 to February 1879 and the beach was named for his wife, Lady Robinson, or Nea Arthur Ada Rose D’Amour. The fifth daughter of the ninth Viscount Valentia. Sir Hercules’ career, Lady Robinson’s as well, reads like a stereotype of British colonial service: Administrator of Montserrat, Lt Governor of Saint Christopher (Saint Kitts), Governor of Hong Kong, of British Ceylon, of Fiji, of New Zealand, Acting Governor of British Mauritius, High Commissioner for Southern Africa, and Governor of the Cape Colony. Yet, he managed to get home to London to die in October 1897, aged 62. Their daughter, Nora Robinson, wed Alexander Kirkman Finlay at St James’ Church in Sydney in 1878. The groom owned Glenormiston, a large station in Victoria. 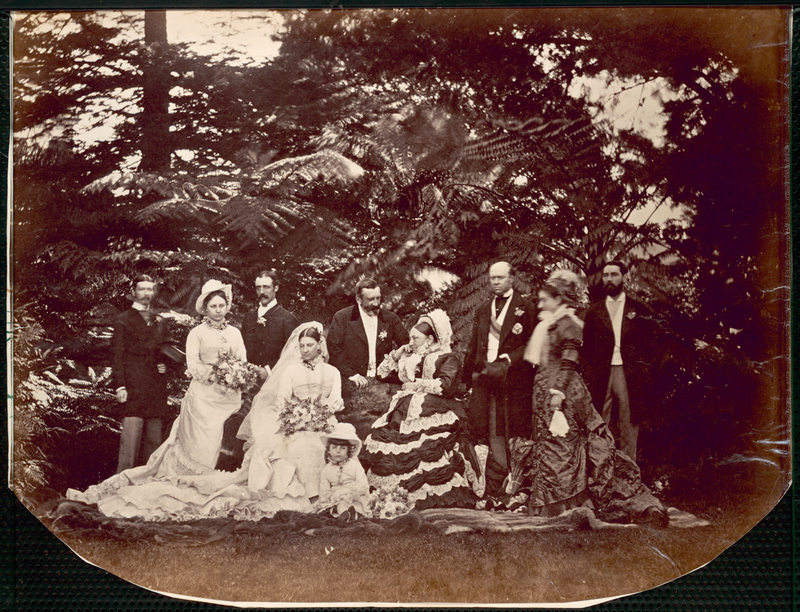 This wedding was the second vice-regal wedding in New South Wales and, as such, attracted much public attention – a crowd estimated up to 10,000 gathered outside the church. I do suggest reading Sir Hercules’ Wikipedia page. It’s both fascinating and a strange and unlikely tale to be tied to this stretch of beach – which, on Christmas Day 2016 is hosting families from all around the world – a few of whom, were surely, from other places touched by Sir Hercules’ colonial hand. The day, while breezy, is otherwise a perfect Sydney Christmas Day: sunny, warm but not too hot, not too humid. Just lovely. Every bit of shade in the reserve has been colonised by a United Nations of families: East Asian, South Asian, Middle Eastern, European, and African. Many are clearly Muslims, some probably Buddhist – the Christians come for a dip and go back to their parties and lunches at home. Christmas is the day when I feel most Jewish, not that I practice, but on this day I usually feel very much an Outsider. But not here, not at Lady Robinson’s Beach, where today is, mostly, a day for non-Christians making the most of a holiday courtesy of the Christian majority. There is a busy shark-netted swimming enclosure. Jet skis buzz along the shore. International flights circle, approach from the southwest, and land on Sydney Airport’s third runway while other planes queue for their turn to depart. In the distance, the cranes of Sydney’s port fill the horizon. I love this beach. 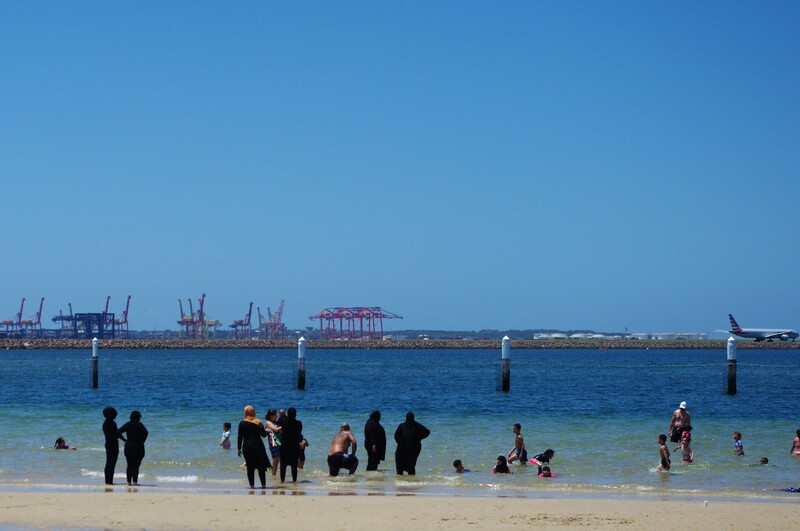 I love how it’s a bit gritty in a working class, working port, immigrant families way – the antithesis of the glitzy beautiful-people blonde-haired blue-eyed stereotype of Sydney’s beaches. There are more women and girls on this beach in burqinis than bikinis. And I love that too. I love that an Australian woman, Aheda Zanetti, started a company, Ahiida, to provide swimming attire that allows Muslim women, who choose to abide by dictates of modest dress, to fully participate in this most Australian of activities – swimming in the sea and enjoying the beach. I wade into the Bay – the water is cooling, refreshing but not cold. I move slowly to where I’m waist deep then dive in. Emerging I feel a wave of welled and condensed emotions – a rejoicing for my return home, finally, to Sydney, and the easy contentment that has brought me, also some nostalgia for the 19 months of travel and volunteering gone by and the knowledge I’m unlikely to have that kind of open-ended freedom again, and, too, some sadness, for hopes unfulfilled. All of that in the woosh of rising out of the water, raising my arms to splash the sea around me, and then feeling the heat of the sun on my wet skin. 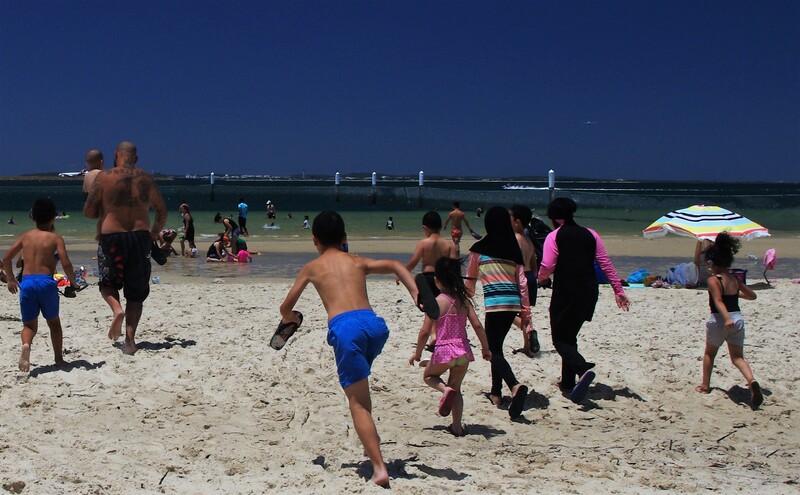 I sit for a time on the beach and write – as I do, an excited family group arrives, first a dad and kids running past me into the water than the younger women, in colourful burqinis, then older women in flowing black hijabs and matching garb. They were all, seemingly, having a really lovely time – while making for a striking scene – these black clad women, wading in the shallows, the planes and port cranes in the background. 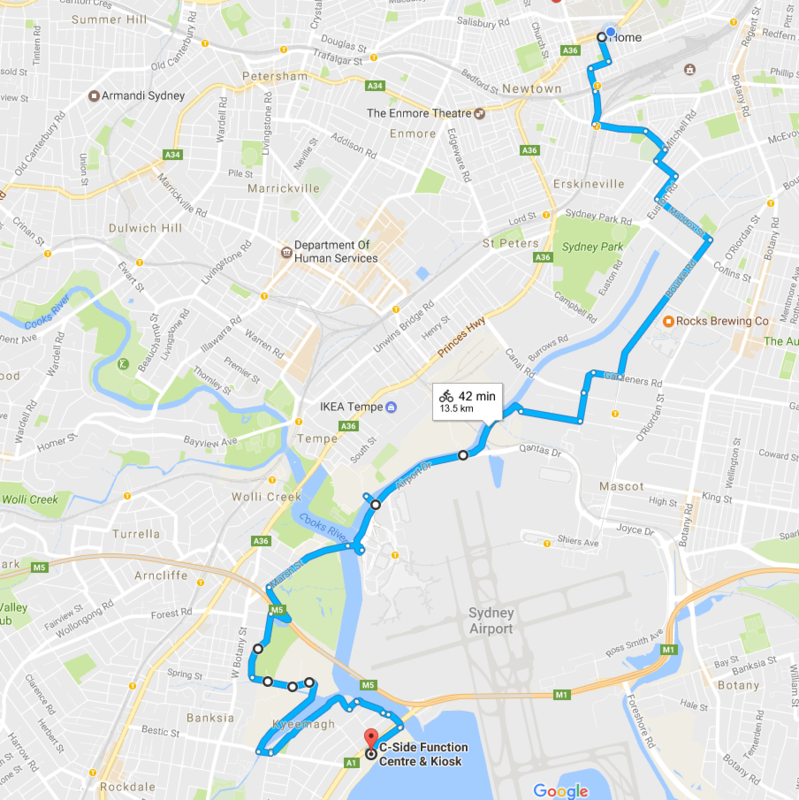 I rode my bicycle home, enjoyed sweet and sour chicken at the Happy Chef then met some new Jewish friends for a screening of La La Land at Bondi Junction. And so, another Australian Jewish Christmas in the books and a good beach from which to restart this blog. Lady Robinson’s Beach was an 13.5 kilometre (8.3 mile) bicycle ride from home. 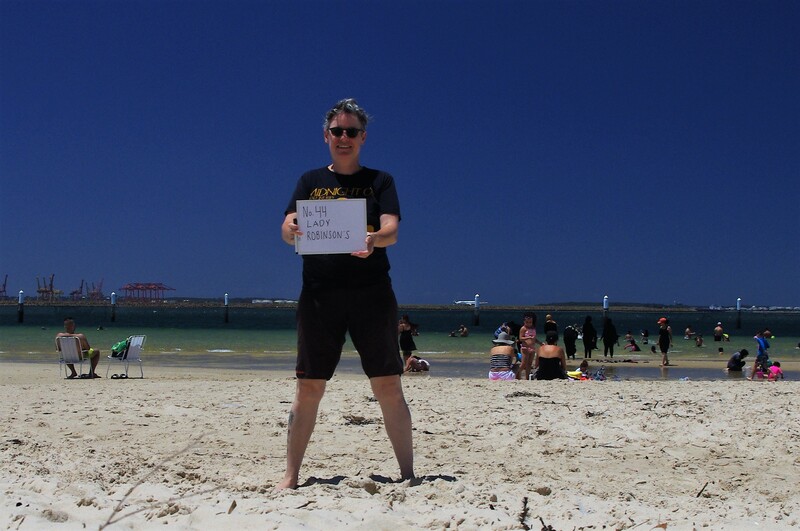 The portion of the beach which I visited is in Kyeemagh, a suburb in the Bayside Council.